Heat 1 tablespoon of the olive oil in a large frying pan over medium heat until shimmering. Add the onion, season with salt and freshly ground black pepper and cook, stirring occasionally, until onion is golden brown, about 8-10 minutes. Add the 2 tablespoon of balsamic vinegar together with the chicken and the thyme and cook for another 2 to 3 minutes until mixture is thoroughly mixed and cooked through. Arrange both flatbreads aside each other and brush lightly with high quality olive oil. Sprinkle mozzarella over the top then scatter chicken and onions over the mozzarella and finally top with cherry tomatoes and blue or goat cheese crumbles. Bake until crust starts reaching a golden color on the bottom and cheese is melting, about 8 minutes. Add strawberry slices about half way, when there 4-5 minutes to go. 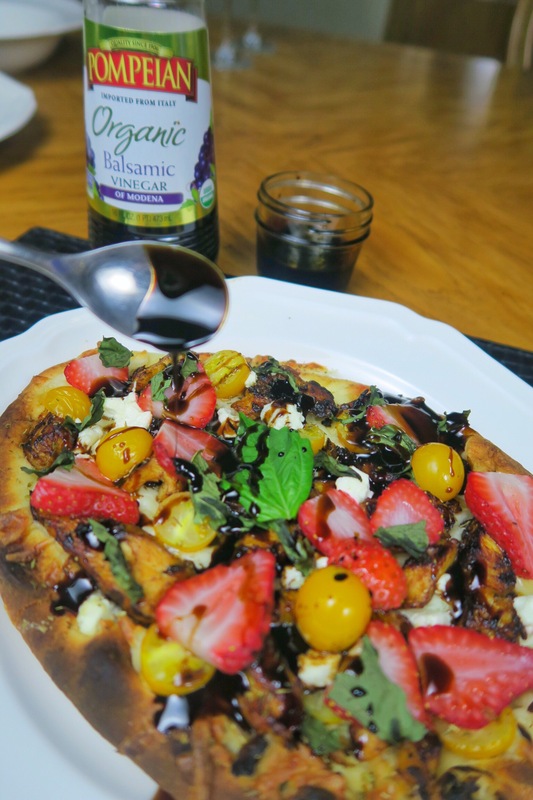 Meanwhile, mix the balsamic vinegar and honey together and drizzle over the flatbreads once out of the oven. You may also opt for simply drizzling balsamic reduction, my favorite! Sprinkle with mint leaves and serve immediately. 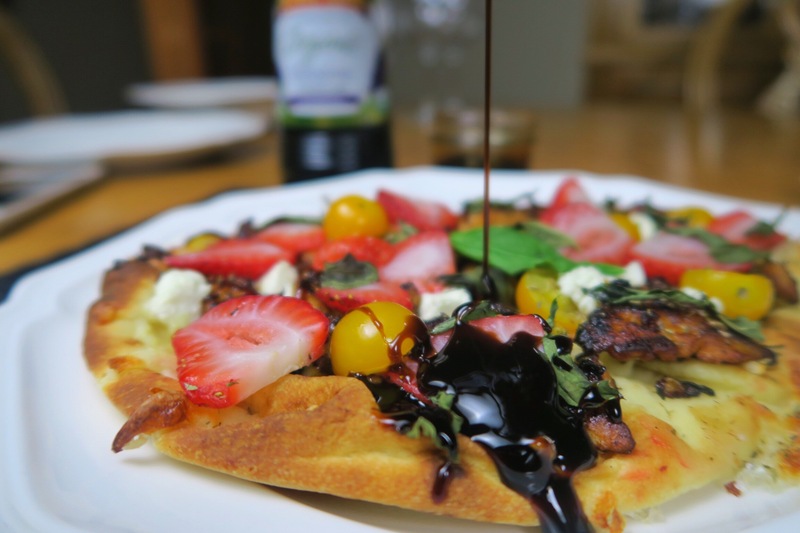 Here is a quick video on how to make this delicious balsamic reduction in 15 minutes! 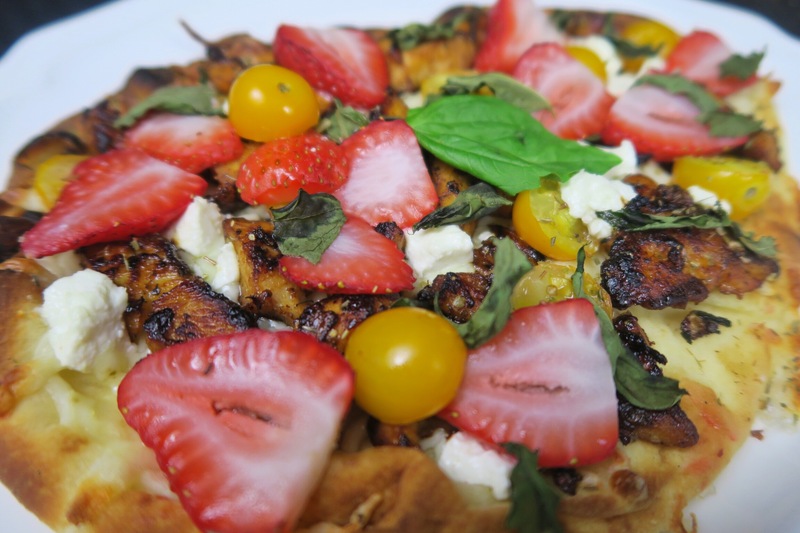 This entry was posted in Appetizers, Dine with me, Entrees, Healthy Pizzas, No More Boring Chicken, Uncategorized and tagged balsamic reduction, chicken balsamic flatbread, strawberry chicken flatbread.